The Congressional Budget Office has warned that 32 million Americans would become uninsured over the next decade if Obamacare is repealed without an alternative in place. Seventeen million would become uninsured next year alone. The Congressional Budget Office has warned that 32 million Americans would become uninsured over the next decade if Obamacare is repealed without an alternative in place. Seventeen million would become uninsured next year alone. The analysis also found the cost of a medical insurance policy would increase 25 percent next year and double by 2026. 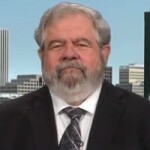 David Cay Johnston, Pulitzer Prize-winning investigative reporter and founder of DCReport.org, offers his views. On Wednesday, the Republican-controlled House Budget Committee approved its 2018 budget resolution. The budget aims to rewrite the tax code to favor the wealthy and to slash funding for Medicare and Medicaid. It would also add another $30 billion to Trump’s record-setting $668 billion request for Pentagon spending. The budget faces opposition from both moderate and conservative Republicans. As the Presidential Advisory Commission on Election Integrity held its first meeting this week, many voting rights advocates worry that the commission will lay the groundwork for a nationwide voter suppression effort. Trump on Wednesday said he never would have nominated Jeff Sessions to be attorney general had he known Sessions was going to recuse himself from a Justice Department investigation into alleged ties between Russia and Trump associates. One Russia expert says the smoking gun indicating a quid pro quo between Russian money and Trump may lie with a little-known case that was abruptly settled involving a holding company linked to the Russian elite. Prevezon’s lawyer is Natalia Veselnitskaya—the same Russian woman who initiated the now-infamous meeting with Donald Trump Jr. last June. A new exposé and cover story in the September issue of the New Republic, titled “Married to the Mob: What Trump Owes the Russian Mafia,” examines how the Russian mafia has used the president’s properties to launder money and hide assets.